As a traveler, one of our tools in making our itineraries is the internet. And I’m so grateful that the internet has lots of information regarding travels, accommodations, transportation and travel experiences. Every time I surf the net for information regarding my trip, I always encounter information from travel bloggers. I am so thankful for them and was inspired by their travels- so I decided to make one. Plus, I also have a friend and my batch in college, Osias of Travel Hotspots in Thailand, who informed me about blogging. That was when I first knew what a blog is all about. He encourage me to have a blog to showcase my photos and told me that I can make money out of a blog. Last summer of 2011, I planned to go on a road trip to Cambodia and Vietnam from Thailand . I am always amazed by Angkor Wat and I want to visit it since it is near Thailand. So I decided to go on a trip together with my then-girlfriend. In planning my trip, I searched the internet for information regarding transportation, accommodation, experiences, expenses etc. That was the time when I encountered the blog of Calvin Lo called Calvin's Hub. He gave a detailed info regarding his trip to Vietnam and Cambodia with his wife. His blog was so informative that it became my main reference for my trip. Because of his blog I was able to do my Thailand, Cambodia, and Vietnam roadtrip in 9 days. That trip was so memorable. It was an independent trip-a backpacking trip. All the information that I needed were gotten from his blog. And since that trip was so memorable, fun, and, so meaningful, I decided to write it, just like what Calvin did, and also to share information to other travelers who want to trample that trail. That was the start of Regin's Travels. After writing my first two posts, there did I realized that blogging is not for the lazy. My blog became stagnant. I was so lazy to update it and write articles. So many trips happened and yet my blog just contained two posts. Then I came across the blog We Are Sole Sisters of Lois Yasay and Chichi Bacolod. And I befriended Lois in facebook. I was inspired by their blog. The writing was superb and their travels are so adventurous. Because of it, I was inspired to continue my then-stagnant blog. Lois kept on encouraging me in facebook as well. We do chat in facebook and she never failed to inspire. Up to this time, I’m enjoying writing my travels and sharing information for other travelers. 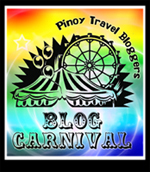 This is an entry to Pinoy Travel Bloggers Blog Carnival themed "The Journey That Made Us a Travel Blogger". Edmar Gu-Quibb of EDMARATION hosts July 2012 Pinoy Travel Bloggers’ Blog Carnival. This trip Regin is indeed memorable. 3 countries for 9 days, I can't imagine myself how I can do it. Glad to know how you started. thank you for joining the blog carnival! I am learning a lot form all of your contributions! Thanks Ed. I know you can do it too. Thankns for this blog carnival too. ps: You know how much I admire your out of the country trips! :D See you soon! Indeed. Thank you so much. Hello. These posts would be helpful.